By purchasing this product you receive from us 5 points that you can use for shopping in our store. This applies only to customers registered in our store. 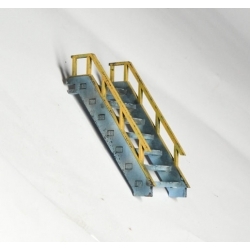 The kit contains two (2) single level stairways for use with the modular industrial tower system. The models come unassembled and unpainted. Miniatures shown for scale purposes only. The single height staircase comprises 9 pieces: 2 sides and 7 steps. Construction is very easy. Lay one side rail outer face down and dab pva glue each side of the step locating hole. Insert the 7 steps (making sure they are detail side up). Dab pva glue on the inner face of the other side rail same as the first one and gently slide each step in turn into its locating hole. Make sure the staircase is square and let dry. The only shortcoming of these pieces is the lack of a baseplate. The step spacing is wide enough to allow the plastic slot type bases of common 25/28mm figures to slide between the steps and hold firmly so the figures appear as if climbing the stairs. The stairs are really nice if you plan to get a few walkways. You can create some really nice scenaries with those.